Savages: Jehnny Beth, Ayse Hassan, Faye Milton, Gemma Thompson . I’d amend that now, but only because I was slighting the band as a whole by singling out singer Jehnny Beth, who really does have Kurt-level charisma. So, what did I mean by that comparison? 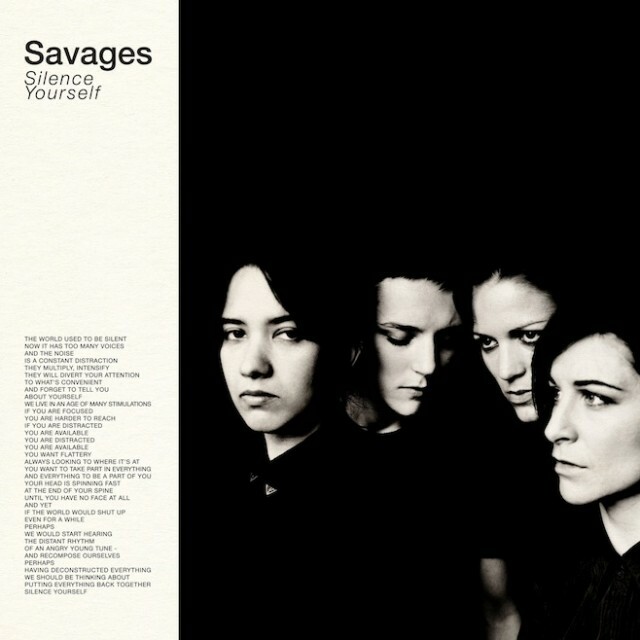 First, much like Nirvana, Savages emerges in the world fully-formed, with an amazing confidence in its abilities and an all-encompassing breadth in its artistic vision—two things that are all the more impressive for the fact that they’ve been a band for a mere 16 months. Second, and more important, while all of the sonic touchstones may be familiar—I’ll emphasize the Wire via a minimalist compositional process that is more about subtraction than addition; you laud the similarities to Siouxsie Sioux and early Cure, if you’d like—the band attacks and reconfigures ’80s post-punk tropes with such intensity and perverse glee that you feel as if you’ve never heard this sound before… just like Nirvana made you feel with its particular brand o’ punk (bubblegum meets Black Flag meets Black Sabbath). “Nothing this band is doing is new,” says the advance guard of the already building backlash. Yeah, well, nothing under the sun is new, every first-year art student knows that. The accomplishment is in the way you put the familiar together in a way that feels fresh, bolstered by your own unique force of personality (and personality Savages has in spades). So, let’s say we do that, shall we? What we hear on the 11 tracks of Silence Yourself is a band that has taken full advantage of the recording studio, working with relatively unknown producer-pal Johnny Hostile to give us a much richer and more varied palette than it favors onstage, where the presentation is all about stripped-down, no-distractions, shear-the-top-of-your-head-off intensity, right down to the black uniforms and stark white light. Some tracks arrive much as they do live, including ferocious barn-burners such as “Husbands,” “City’s Full,” “Hit Me,” “She Will,” and the opening “Shut Up.” But on album, there is much more breathing room, color, and sonic diversity, and the balance of the disc is moodier and more expansive, insinuating instead of asserting. Heck, “Dead Nature” is a short interlude that could pass for Cage or Stockhausen, while the closing “Marshal Dear” even has tinkling piano and an atonal clarinet solo resonant of Patti Smith in her free-jazz period, circa Radio Ethiopia. Throughout, Gemma Thompson alternates moody washes of creepy ambience with pure six-string slash-and-burn. Drummer Fay Milton switches between tribal pounding and much more angular punk propulsion, always locking in with machine-like precision to the loping bass lines of Ayse Hassan. And then we have Jehnny, or Camille Berthomier, if you prefer (and here I ought note in the interest of disclosure that her sister back in Paris, Maud, is a scholar of rock criticism who became a friend while working on her doctoral dissertation). What I hear is anger, disgust, and contempt for much of the modern condition, and here, I have my specific gripes, you have yours, and Savages have theirs (including that stuff about cell phones). But I also hear optimism—in the form of the power of uncompromising sounds to make a world of crap more bearable, and via the belief that refusing to treat people as idiots will be rewarded, at least via a connection with those people who are not idiots. Which is to say, if you listen to this music and don’t feel something, I doubt that you’re really alive. And I don’t think I care to know you. 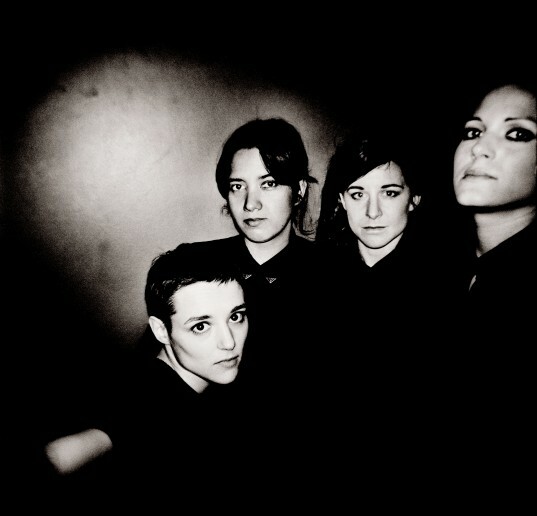 Savages perform at the Pitchfork Music Festival on Saturday, July 20.